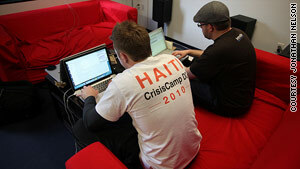 Volunteers at Saturday's CrisisCamp Haiti work on digital mapping and iPhone apps, among other projects. (CNN) -- A weekend meeting of technology pros looking to help victims of the Haiti earthquake yielded some ready-to-roll projects and a few more nearing completion. Perhaps more important, participants say, the gathering produced a framework that could keep aiding disaster-relief efforts in the months and years to come. CrisisCamp Haiti brought together developers, programmers and other volunteers for meetings in Washington, Los Angeles, California, and other cities. Results included a digital map to help relief groups in Haiti coordinate their efforts and applications for the iPhone and other smartphones, including a Creole-to-English dictionary. "There was virtually no moving around," said Noel Dickover, a CrisisCamp co-founder and one of more than 200 people who attended the session in Washington. "Everyone was sitting there working and really getting stuff done for the entire time." Dickover said an open-source, interactive map that the group worked on already is being used by relief organizations working in Haiti to help coordinate their efforts. A Craigslist-style Web site that would allow groups in Haiti to exchange supplies and other assistance is almost ready, he said. Apps for the iPhone and Android smartphone system also are on their way. One application would allow real-time communication in Haiti, where the telecommunications network was ravaged by the earthquake. That app, and the Creole translation app, must win approval from Apple and Google before they will be available to smartphone users. Participants called the Saturday sessions hectic, but rewarding. "It really did feel like we were actually being able to help out, even though we were so far away -- just using our skills and what we do normally to bring this information together for people," said Brendan Lim, who works for Intridea, a Washington-based Web development and consulting firm. "It was really gratifying and it feels good to keep working on those things and, hopefully, make something useful." Several of the sites that hosted camps on Saturday already are planning follow-ups, while other events are being organized in other cities. The work is not just to make the participants feel good, they say. Volunteers included representatives from government agencies, including the State Department, and such tech companies as Google. The search-engine giant is looking to incorporate some of the group's work into its own mapping system, which has been used heavily in Haiti, Dickover said. Organizers also are inviting people who can't attend any of the planned get-togethers to pitch in from where they are. Several of the projects are open-source, allowing remote users to improve coding and other aspects of the projects. They've set up a wiki page and a Twitter account so people can stay up to date on their progress or volunteer to pitch in. They're also stressing that while advanced technical skills are nice, they're not necessary. "Probably about 30 percent of the folks who came to the camp in D.C. were coders, but there were 30-35 people who had never done any kind of mapping before," Dickover said. "We had folks just entering data ... . There's a lot of stuff somebody can do who's just Internet savvy." They're hoping that their volunteer work, which came together with virtually no pre-arranged framework or schedule, will have an impact throughout the response to Haiti's disaster and beyond. "The hope is that it saves lives," Dickover said. "This is really a test case. We're just testing the idea out, but imagine three years down the road when we've done this three or four times."